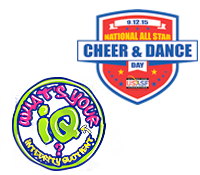 US All Star Federation: What's Your IQ? 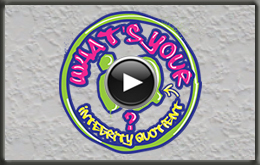 WHAT'S YOUR IQ - INTEGRITY QUOTIENT? What's YOUR IQ? Elevate your Integrity Quotient with this monthly team activity that builds individual character and team unity! Athletes and coaches introduce a new word each month that supports the overall theme of "Integrity" and encourages conversation in gyms and studios about how athletes, teams, coaches and owners can personally be the example, and encourage others to be the example, of that month's word. So, start the conversation! Download both versions of the video and the Conversation Starters each month, and share them with your teammates, on your website and in social media! Be spectacularly great at what you do. Wear your passion on your sleeve and hold your heart in the palm of your hand. And work hard. Really hard. Name one person on the team who is the team motivator? How does it make you feel when they motivate you? Name one person on the team who demonstrates passion for the team. Name one person who is enthusiastic. Describe what happens when team members are not enthusiastic. Describe why positive affirmations help you? What can YOU do to be considered a passionate, enthusiastic and motivating team member? Describe an act of sportsmanship that you have witnessed. Describe an act of un-sportsmanship like conduct they you have witnessed. Describe what someone who is not humble might sound like. What is the difference between pride and arrogance? Is your program/prideful? Or boastful? How do you feel when another team is boastful? How can you practice humility within your own gym? What can YOU do to contribute to being a team known for good sportsmanship? Do you feel everyone deserves to be respected? How do you respond to someone being disrespectful? Within our team- are we respecting each other? What can YOU do to earn the respect of your teammates and your competitors? If you're not loyal to your team, you can get by for a while, but eventually you will need to rely on their loyalty to you, and it just won't be there. Describe someone who is loyal. Describe within the team how disloyalty can impact the team. Commitment means what to you? Who is the most loyal person on your team?Describe how a dedicated team member acts. Is loyalty something that no longer exists? Why is loyalty important to the team? Are you loyal and dedicated to your team? What can YOU do to demonstrate to your team your dedication, devotion and loyalty? Disciplingng yourself to do what you know is right and important, although difficult, is the highroad to pride, self-esteem, and personal satisfaction. Who within your team demonstrates great self-discipline. Describe a circumstance that requires self-discipline. What circumstances challenge you to NOT be self-disciplined? How do you feel when you know you have chosen to be self-disciplined versus taking the easy way out? What can YOU do to become a more self-disciplined athlete? Do you consider yourself a trustworthy team member? Describe someone on your team that you trust. What actions do you need from a team member to trust them? How can lack of trust negatively impact your team? What can YOU do to become a more trustworthy team mate? What do you want your contribution to the team to be? Are you the passionate leader, and an honest and respected member of the team? Are you devoted to the team, sacrificing other opportunities to fulfill your commitment? Are you self-disciplined and someone that your team members trust? Do you demonstrate humility and good sportsmanship? Do you have confidence in yourself and are you courageous with your choices? Do you have a firm set of beliefs and a strong faith in your team? Do you demonstrate loyalty to this team and to your program in and outside of practice? Integrity is about more than just being honest. It's about doing what is right for the right reasons. Not for attention, accolades, or rewards - but simply because it is the right thing to do regardless if anyone knows or not. Don't walk through life just being an athlete. Athletics will fade. Character and integrity and really making an impact on someone's life, that is the ultimate goal. …you saw your teammate stealing a bow from a vendor at a competition? …you noticed that a stranger dropped a $20 bill the same day you wanted to buy something for you? …you saw the last piece of chocolate cake in the fridge but knew your sister was hoping to have it for dessert? …you jokingly said something at practice and later heard it as rumor? …you witnessed a classmate being bullied in the hallway at school? Who in your life is an example of living with Integrity? Describe someone you know with Integrity. What changes can YOU make to become a person of Integrity? What is the key word to gain confidence? What have you done to prepare for the season? What have we done as a team to build our confidence? Within your team, site some examples of courage? Think of someone you admire who displays confidence? How can lack of self-confidence impact our team? What can YOU do to develop your self-confidence? What would it be like to run a race wearing a heavy backpack? Or trying to race with your legs tangled in a rope? Would you give up? How would you feel if you accomplished the task? Describe someone who has displayed patience within your team? Would you describe yourself as a patient person? What are some strategies as a team can you develop that will define you as a team of perseverance? What can YOU do to be considered a person of perseverance? What are some of the things you have sacrificed for the team? Choose one person on the team who continuously displays sacrifice for team. What do you think is the result of having team members who are not willing to sacrifice for the sake of the team? If you were not chosen by your teammates as someone who displays sacrifice, what can YOU do to demonstrate to your teammates your willingness to sacrifice for the team? Resist your fear; fear will never lead to you a positive end. Go for your faith and what you believe. Does our team have a strong faith in each other? What do we believe to be true about our team? Who do we rely on when in doubt? What happens to a team when there is no faith in each other? What strategies can we implement to become a team of faith? I believe that we are…. I believe that we will…. What can YOU do, to be more faithful to your team and your coaches?